We are proud to announce the successful completion and demonstration of a Small Business Innovation Research (SBIR) Phase 2 effort to develop a replacement radio for a maritime environment which provided anti-jam waveform capabilities. This development effort resulted in a customer demonstration of a replacement communications system for a legacy radio, which did not provide anti-jam capabilities and was therefore susceptible to RF jamming. We were very pleased to team up with GIRD Systems Inc. for this effort. The delegation of work for this effort was for GIRD Systems to focus their efforts on the OSI Physical Layer of the communications stack, while we focused on the higher layers of the OSI protocol stack to create a fully functional replacement networked radio for a maritime environment. 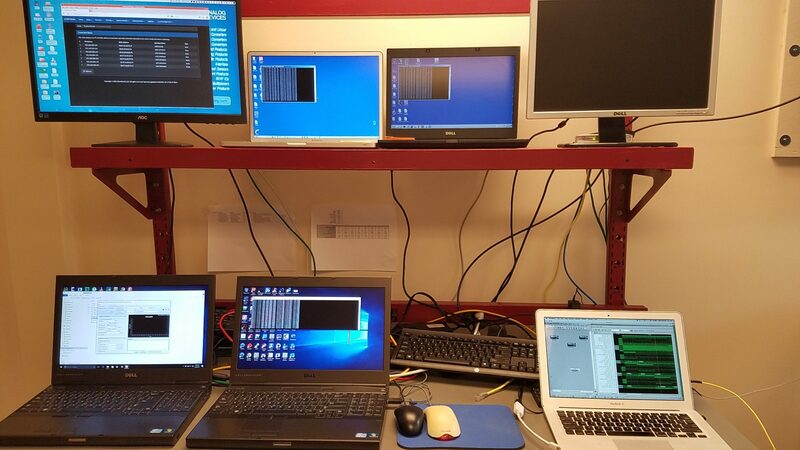 GIRD Systems implemented and successfully demonstrated their custom “smart” RF anti-jam technology, resilient to RF jammer interference at specified power levels, durations, and signal jamming types. GIRD Systems Inc. specialized in custom signal processing solutions for communications systems with a particular focus on waveform development. GIRD Systems has developed novel algorithms to remove sources of interference that are not susceptible to traditional filtering techniques, offering real-time suppression and mitigation of interference sources even when the characteristics of the interference source are unknown. Excluding the Physical Layer, we developed the software protocol stack for the radio to act as a transparent OSI Layer 2 device. This required the development of a low latency bridge between the wired and wireless interfaces of the radio to facilitate the specified host sensor data rates. The RoboCom low latency software platform was leveraged to accelerate the development of radio network protocol stack using a fully tested and integrated software framework for embedded systems running on embedded Linux. The radio protocol stack that we implemented utilized “smart bridging” technology, which limited the host packets transmitted over the network to network control packets used for network discovery and management, broadcast packets, and only host data packets whose IP destination was known to exist on the wireless network, learned passively from monitoring network traffic. This allowed the radio to exist as a network device plugged into what could be a very active host network, and reduce the data packets transmitted over the bandwidth constrained RF network to only host-to-host packets that required an RF signal path. Smart bridge technology prevents bandwidth waste, reduces collisions over the RF network, and increases available bandwidth because of fewer nodes sharing the resource limited wireless spectrum. The maritime environment in which this radio exists, required the development of a custom Time Division Multiple Access channel access protocol to coordinate the exchange of host packets across the network using a custom handshake protocol. This protocol required dynamic frequencies and dynamic data rates unique to the challenges of communications of mobile units in a maritime environment. This custom protocol was designed and developed within the OPNET simulation environment and resulted in the creation of an OPNET Bridge Model to test and evaluate the behavior of this custom channel access algorithm. An essential part of this development was to develop a network stack which was backwards compatible with the legacy radio in both network behavior and performance, as well as command and control. The legacy radio had a SNMP agent interface as its primary control interface in addition to a web interface. For the replacement radio to be a “plug-in” replacement, we had to develop a fully function SNMP agent interface which was identical to the SNMP interface of the legacy radio, and then extend this SNMP interface with additional functionality. Having compatibility at the SNMP agent layer allowed the radio to “plug-in” to the customer’s existing framework without having to change their legacy custom SNMP management application used to manage the radio network. We have developed several network devices with SNMP agent capabilities to provide upstream management. This often requires the development of a custom SNMP Management Information Base (MIB), which defines the functionality implemented by the SNMP agent interface of the device. For this effort, we needed to utilize a legacy MIB and then extend it in a backwards compatible manner to accommodate additional functionality. The demonstration system for the radio network consisted of radio simulators executing on a network of Xilinx ZC706 multi-core ARM based hardware platforms and Raspberry Pi 3 ARM devices. Host traffic was simulated using the commonly used industry standard JPerf/IPerf network performance test application using UDP traffic at a specified maximum host data rate along with host to host ping traffic to observe and measure network latencies. We want to thank GIRD Systems Inc. for inviting us to work with them on this development and bring it to completion by way of a successful customer demonstration.